At Tampa Veterinary Hospital, we love seeing all types of animals- not just the furry ones! We enjoy seeing lots of reptiles and amphibians- but there are some toads out there that we wish just weren’t around. You may have already heard of the Bufo toad- and how deadly they can be. There have been recent news reports out of Polk County about a working farm dog encountering a toad- unfortunately with lethal results. Many of the news reports referred to the toad as a Cane toad. 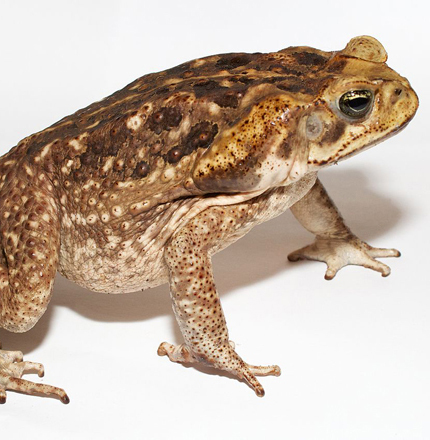 Please know that the Bufo toad and the Cane toad are the exact same thing- so don’t be confused into thinking there is another killer toad species hopping its way north. We have used the name Bufo toad for many years as this invasive species has continued to expand its habitat further north in the Sunshine State. (Bufo toad is actually sort of redundant, since Bufo is Latin for toad) The scientific name of this toad is Rhinella Marina. Previously, the scientific name was Bufo Marinus- hence the name Bufo toad. I am unclear as to why the scientific community changed the name- but I wanted to ensure all of our pet-loving friends that there is still only one toad out there posing a potential threat. If your pet has encountered and interacted with a Cane toad- the impacts will be almost immediate. There are some resources out there on the internet stating that the Cane toad can spray its poison at your pet. This is not true. Your pet must ingest their poison through the mouth. Time is of the essence. If possible, rinse your pet’s mouth with as much water as possible. If you have access to a garden hose, use it- by placing your pet horizontally on the ground. Do not force water down their throat, as water may enter their airway causing them to choke- and you could force more venom into their system. Pay particular attention to the flaps of their mouth, as the venom can still be present there as it is sticky and can adhere itself to the mucous of the flaps. You can also use a wet cloth to wipe their teeth and gums while rinsing with water to remove the toxins. Call your veterinarian (or an emergency clinic after hours) and take them immediately for treatment. If left untreated, the mortality rate is close to 100%. Can I prevent Cane toads in my yard? The best way to minimize your risk of Cane toads around your home is to take away their source of food. If they can’t eat, they can’t survive. Their natural diet includes beetles, centipedes, millipedes, roaches, spiders and other native insects. If you have a pest control or lawn care company- discuss with them pet-friendly options to limit the insects around your home. Like most other animals, they will eat most anything. So limit their unnatural food sources like food left outside for pets or strays. They will eat cat or dog food, so do not leave it out overnight. If you leave a water dish out overnight, we suggest dumping it out nightly and turning it upside down. Toads may wish to hang out in a filled water dish, and may leave their toxins behind. Minimize your light sources in your yard. Toads are drawn to the light- as the light also attracts bugs to eat. Minimize the amount of time your pet spends outdoors unsupervised. Almost all encounters between pets and toads are when the pet is not being watched. We know it’s hard to keep an eye on your pet 100% of the time, but your pet is curious almost 100% of the time and a hopping toad is an irresistible toy that they want to play with. Cane toads are often easily identified by their size, as they are the largest toads on the planet. They can grow as big as 9.5 inches, with average adults being bigger than 6 inches. 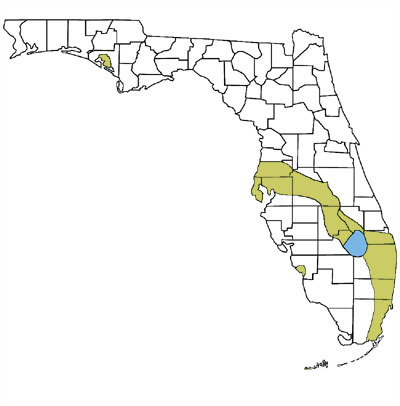 There are no species native to Florida which grow larger than 4 inches. The second most identifiable characteristic behind size will be on the top of their heads. The Cane toad has no ‘crests’ or bumps behind their eyes. Native toads will have these bumps which almost look like a pair of ears. We’ve found a couple of great videos on the internet which can help you identify what a Cane toad looks and sounds like. The Cane toad was introduced in South Florida in the 1950’s. Due to their voracious appetite, someone thought they could be a natural pest-control system for sugar cane fields. Since the 1950’s, they have migrated north and west- all the way through Hillsborough and into Pinellas and Pasco counties. They are most active through the warmest months of the year, with mating season beginning in March and ending in September. They are most active during the evening hours, but can be found during the day in deeper vegetation. They are commonly found in developed areas, perhaps even more so than in rural areas. Since we are now entering the most active months of the Cane toad, it is important to continue to minimize your risks by limiting your food sources around your yard, and keeping your eyes (and ears) on alert. Recently I was away on a cruise. My dog Mozart got very sick & I almost lost him.